The crack Shea Weber put in Henrik Zetterberg’s helmet has spread to the Detroit Red Wings’ psyche. As the conference quarterfinal series between Detroit and the Nashville Predators has gone on, Weber’s King Kong impression has been overshadowed by his teammate Pekka Rinne’s dominance of the Red Wings. Through the first four games Detroit has averaged 34.5 shots per game while Nashville has averaged a measly 22.8, good enough for fewest among playoff teams. Rinne’s performance has stalled the regular season’s seventh best offense and only allowed them to score more than two goals one time in four games. 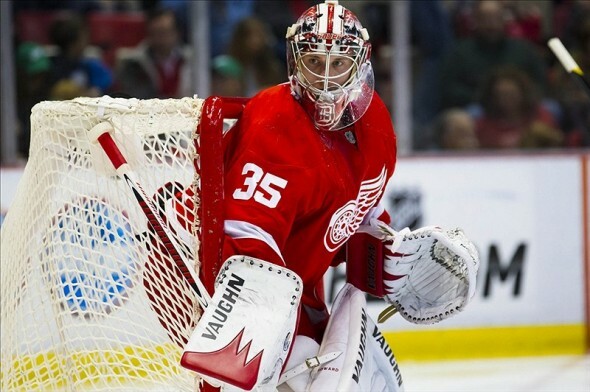 At the other end of the ice, Detroit goalie Jimmy Howard has struggled with a 2.78 GAA and a .879 save percentage. While those aren’t quite Illya Bryzgalov numbers, the bottom line is Howard has a 1-3 record and hasn’t been the calming force his teammates in Detroit have needed. It’s never a good situation when a team is afraid to make mistakes while playing against a hot goaltender. There’s stress at both ends of the ice. Obviously the Red Wings’ lack of scoring hasn’t afforded them the luxury of being able to make mistakes. Which is why the now infamous gaffe from game four is now threatening to linger all summer in the minds of Ian White and Jiri Hudler. Both of the two were sucked into the corner behind Nicklas Lidstrom by Martin Erat, leaving Kevin Klein wide open in front of the net in a play that infuriate even a pee-wee coach. Klein not only scored Nashville’s game winning goal, he further that exposed that crack in Detroit. That play was the best example, but there are other times when the Wings don’t seem to be thinking clearly. They’re frustrated which is odd from a team of veterans, which has so much playoff experience that they should have ice running through their veins against the young Predators. Even though their team is on the brink of elimination there’s still hope for Red Wings fans. They’ve been peppering Rinne with so many shots that slipping one by him early in game five could put enough of a dent in his mental armor to turn that one goal into three or four. They just have to hope Howard can keep them in it for that long. Also on the plus side is that Johan Franzen should have a ton of energy after barely showing up for the first four games. Franzen should get Evgeni Malkin’s number and send him a quick thank you text for taking all the heat from the national media for his disappearing act in the Penguins/Flyers series. “The Mule” is more of “The Goat” so far against Nashville. Detroit needs his clutch play worse than ever right now but so far Franzen has only one goal in four games. Even a little contribution from Franzen could be all the difference, three of the series’ battles have been one goal games. Franzen scored in Detroit’s only win. The Red Wings have enough mental strength to come back in this series. Despite being minus 3 Zetterberg has played well throughout the series so far and Datsyuk has gotten on the score sheet three times. Their play, along with some good old-fashioned Jimmy Howard shot stopping, needs to plant an early seed of doubt into Rinne and the rest of the Predators before that crack breaks all the way through.